Easter Monday in Greece celebrates when Mary Magdalene found where Jesus had been buried and the tomb empty. This holiday occurs the Monday after Easter Sunday. On Easter Monday many people spend time quietly with their family and friends. 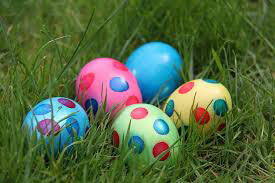 It's common for many families to have Easter egg hunts and spend time outside in the nice spring weather. Most buildings are closed however airports and railway stations are open. Jesus's tomb in the cave he was buried in was found empty. That was believed as Jesus's resurrection.